As changes to legislation allowing 18 year-olds to drive lorries takes effect, one north-east teenager is already among some of the youngest people in Britain to legally drive a 44 tonne truck. David Weston, an employee of the John Lawrie Group, recently completed his C+E driving test with no minor faults and can now take the wheel of an LGV with a combination weight of 44 tonnes MAM (Maximum Autho rised Mass). 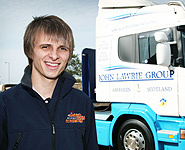 The 19 year-old, who is also a talented rally driver, passed his test two years early as his Aberdeen-based employer was signed up to the nationwide Young LGV Driver Scheme. The scheme which was run by Skills for Logistics allowed employees of companies signed up to the scheme to obtain Category C and C+E licences from the age of 18 rather than 21. From Thursday, 10 September 2009 this scheme became non-existent as the introduction of the Driver CPC (Certificate of Professional Competence) meant than anyone from the age of 18 could obtain a Category C licence as long as they passed the initial Driver CPC. It was also introduced in an effort to get more young people into the haulage industry at a time when the average age of an LGV driver is over 50. Vic Sinclair, group managing director, comments, “John Lawrie Group is committed to developing the skill sets which our employees have and nurturing talent within the company, through a programme of structured training. This is illustrated with our involvement in the Young LGV Driver Scheme which offered our younger employees a great opportunity. “David is a very talented youngster, and he has displayed it behind the wheel of rally cars and trucks. He has shown great maturity in obtaining his Category C+E licence at such a young age, and only six months after he passed his Category C test with no minor faults. The Young LGV Driver Scheme offered a detailed, structured programme which provided candidates with all the knowledge, experience and ability to safely operate LGVs. In addition to working for the John Lawrie Group, which has worldwide operations in a diverse range of industries, David is a talented young rally driver. During 2009 he competed for the first time in all the rounds of the British Rally Championship driving a Subaru Impreza (R4), and finished in fourth place overall in the championship. Offering a diverse range of industrial services, one of the country’s leading privately owned companies, the John Lawrie Group has developed an enviable reputation for quality customer service since it was established in Aberdeen in the 1930’s as a scrap metal merchant. It is a multi-million pound international group of steel trading companies operating throughout the UK and in USA, Canada, Europe, the Middle East, China and New Zealand, employing a 100 strong workforce.